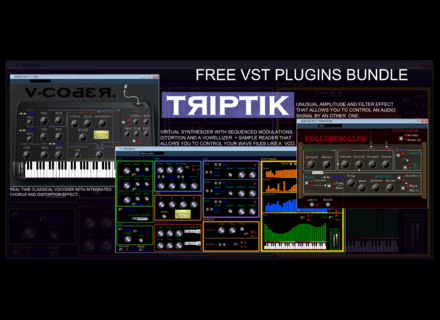 TRIPTIK, Computer Music software bundle from Audioutsider. Audioutsider launched the free Triptik bundle for Windows which features a vocoder, a synth and an advanced envelope follower. Polywaves, a virtual synth with 3 VCO, 3 VCF, 3 LFO with 3 destinations, an oscillator for phase distortion, 2 ADSR envelopes, a distortion and a Vowelizer. A "Samplizer" allows for playing an audio sample on the keyboard (with pitch changing with the keys) and an arpeggiator/16 step sequencer is included (with amplitude, cutoff frequency and pitch controls), along with 100 presets. The plug-in supports MIDI Learn. V-Coder: a classic vocoder which operates in real time, with 2 VCO, 3 VCF, a noise generator and an effect section with chorus and overdrive. You can adjust the attack, release, decay and frequency bands, as well as the mic gain, dry/wet mix and master volume. FollowTroller: an envelope follower with attack and decay controls, VCA and VCF modes, and frequency or resonance control switch. You can download this bundle for free from audioutsider.wix.com/audioutsider. The Sega Megadrive synth in VSTi for PC Aly James Lab announced the release of F-MDRIVE YM2612, a Windows software that emulates the Sega Megadrive built-in synth.